The latest technological advancements brought sea changes in the manner how people collect information. Olden days were synonymous for newspapers and television for collection and broadcasting of news. However, there is appearing a declining trend in the circulation of these time-tested channels. 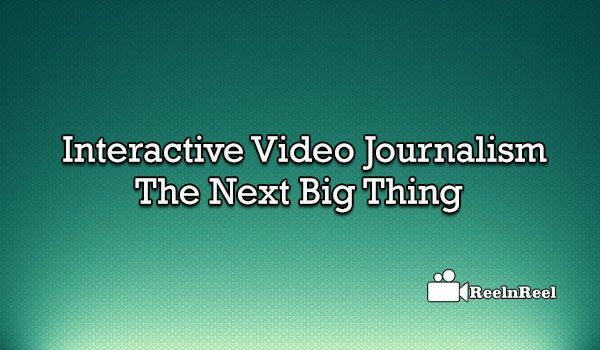 The complete description of Interactive Video Journalism is explained here. The majority of this declined chunk is moving to interactive video journalism. It is a new type of journalism allowing consumers to contribute to the story directly. This feature is an addition to the previous practice of news collection by reports, news presentation by news readers and news observation by the audience. Before interactive video journalism, people shifted their focus from paper to the internet. Interactive journalism has the potential to redefine news and allowing the consumer to determine what has news value in his perspective. Once the reader is aware of what he wants, he can search the same, and if possible he can change his avatar to becoming ‘news reporter’. This is where interactive journalism is finding its place. Data visualization reports are the methodology to present the data in the more appealing way. As we all know, graphs, tables and pictures are the best ways of presenting the data. This is the advantage of data visualization reports. Data has always been believed to have 3 components i.e, data collection, data reporting and data analysis. What is missing in this formula is data presentation. • Bring simplification in data. • Be aimed at a point without unnecessary detailing. • Maintain the flow of data in a logical way. • Collect accurate and updated information. • Choose the best fit – data, graphs, chart etc. Now that the television news is losing its supremacy it enjoyed previously because of reasons mentioned above, there has been a big change in big news channels in their approach to tackling the interactive video journalism. The most fact for television industry is that the TV viewing in many countries has declined by 3%-4% since 2012 and this decline is directly comparable to the decline in print circulation as well. However, this decline is not going to change the fate of television immediately, and there is bound to be the further decline as well. Knowing fully aware of the present day requirements many news organizations, which once depended heavily on a routine way of functioning, are now experimenting with different kinds of TV like an online video news. The moment we talk about social media, the immediate things that come to mind are names like Twitter, Facebook etc. All these social media are providing information which can share with the circles across Intra and inter platforms. The audience is having increased expectations regarding the content they want to see/read/share. Interactive video journalism is enabling the viewers to contribute their share to the content as well. In other words, is social media revolution giving the true key factors of journalism, i.e., transparency, honesty etc.? Social media like Facebook and Twitter are becoming more and more important, and they can offer the ability to create one’s applications easily. Now the question is how the media professionals can use the tools and applications like Twitter, social media etc. Taking a cue from the requirements of the audiences as well as the advanced features offered by social media, it is strongly believed that news organizations will move towards increased use of mobile devices and also rely on interactive video journalism.